Niccolo Machiavelli was an Italian politician, historian, diplomat, humanist, writer and philosopher. For many years, he was an official in Florentine Republic where he had duties in the diplomatic and also military affairs. 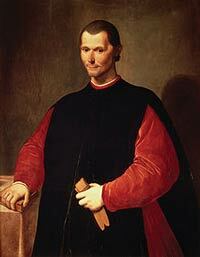 Machiavelli was the founder of the modern political science, especially the political ethics. As a writer, he wrote carnival songs, poetry, and comedies. Niccolo was born in Italy in a town called Florence. He was taught grammar, Latin, and rhetoric during his early days in school. At age 29, he was elected as the head of second chancery and in July 1498, he became secretary of Dieci di Liberta e Pace. Here he acted as a diplomat responsible for the negotiation and also the military affairs. Between 1499 and 1512, he carried out diplomatic missions. Niccolo is best known for the book, The Prince. This book talks about politics and especially the traditional subject of the hereditary prince. It also concentrates on the emergence of anew prince. It states that in order to retain his power, the traditional hereditary prince must maintain the normal sociopolitical institutions that people are accustomed to while the new prince has a much more difficult duty in ruling because he must first try to stabilize his new power. Machiavelli believed that the public and private moralities are two different things and every leader must understand this in order to be a great ruler. A ruler must not be concerned only with their reputation, but must be willing act immorally at times as well. He also emphasized occasional need for exercise of force or even deceit. In his Discourses on Livy, Machiavelli uses a series of simple lessons to show how the republic needs to be started and constructed. The book openly explains the great advantages of republics and other themes. In 1514, Machiavelli wrote a book in Italian called Della Lingua, which is a dialogue in regards to Italy’s main language. He also made a comedy entitled Le Maschere, which included some living Florentines as characters. Machiavelli explained so many times that religion is simply man-made. He also said that religion lies in the contribution to the social order and other rules of morality need to be dispensed if only security requires it. While the great fear of God can simply be replaced by the fear of a prince, Niccolo believed having a true religion is essential in order to keep a republic in place. For him, a true prince should not be conventionally religious, but he should be in a position to make the people religious. Niccolo Machiavelli died in 1527 at the age of 58. He is buried in Florence, Italy.